They always like to hear they're having mac and cheese. Wait until they see it in pie form, loaded up with chopped ham, a bit of broccoli and extra cheese! 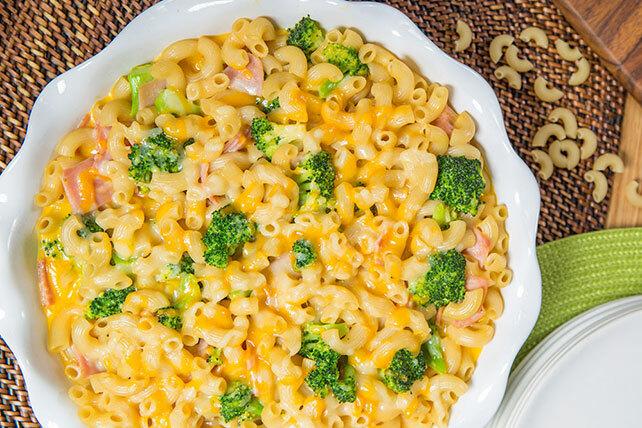 Cook Macaroni in large saucepan as directed on package, adding broccoli to the boiling water for the last 2 min. ; drain. Beat eggs in small bowl; stir in Cheese Sauce. Add to Macaroni mixture with ham; mix well. Spoon into 9-inch pie plate sprayed with cooking spray; top with shredded cheese. Bake 30 min. or until macaroni mixture is set in center and top is golden brown. Serve with a mixed green salad and fat-free milk as part of a simple weeknight dinner. Bake this pie ahead of time, then refrigerate and reheat in the microwave as needed for part of a quick weeknight meal. Prepare using OSCAR MAYER Honey Ham.